What is a parser game? How do I enter my game? Parser games are a well-known form of computerized fiction. To play a parser game, players type commands at a prompt, and the game attempts to parse those commands and carry out actions. Popular parser games include Will Crowther’s Adventure, Infocom’s Zork and Hitchhiker’s Guide to the Galaxy, Andrew Plotkin’s Spider and Web, Admiral Jota’s Lost Pig, and Emily Short’s Counterfeit Monkey, among a great many others. In the modern era, many parser games can be played directly in a web browser, though others may require an interpreter. A winner, second place, and third place will be awarded in each of the categories above. There will be no prizes – just the pride of accomplishment. To enter ParserComp, go here to upload the first draft of your game. The first draft is due by midnight Eastern on February 1, 2015. Remember to include a walkthrough! For the purpose of this competition, a parser game is one that accepts typed input, processes that input with a parser, and interprets the parsed commands within a world model. A list of tools for making parser games can be found here. If you don’t want to use it, you don’t have to. Games that do not use the theme will not qualify for the “use of theme” category. They will not be penalized in any other way. If you started work on a game before Nov. 1, that game does not qualify for ParserComp. One game per author is recommended, but if you get really inspired, that’s okay. Just don’t get too carried away. The first draft must include a walkthrough that demonstrates the game can be played and finished. Only games that have a first draft in by February 1, 2015 will be eligible to participate in ParserComp. The purpose of the polish window is to allow time for betatesting, bug fixing, etc. However, your first submitted draft can be your final draft if you don’t have any changes. Talking about your own game is okay, but don’t talk about other people’s games. Anyone who isn’t participating can judge the games. A judging link will be provided when the games are released in February. This helps ensure a level playing field. Writing – Is the game’s prose well-written? Story – Is the game’s story interesting and enjoyable? Puzzles – Does the game have puzzles? If so, are they well-designed? Use of Theme – Did the game make use of the ParserComp theme? If so, was the theme integrated well? Technical – Is the game polished or buggy? Did the game do anything unusual or noteworthy with the parser format? Overall – What is your overall opinion of the game? Would you recommend it to other people? These scores will be used to determine awards, but they will not be publicized or provided to the authors. In order for a judge’s ratings to be accepted, the judge must provide a few sentences of feedback on the game as well as the numeric ratings. This feedback will be delivered anonymously to the game’s author at the end of the competition. Want to participate? Not sure how to start? Each of these authoring tools has been the basis for one or more games submitted to the Annual Interactive Fiction Competition within the last five years. If you need to find beta testers, want to talk about your ideas, or hit any snags while authoring, you can get help from an active support and discussion community at www.intfiction.org. IFWiki – the Interactive Fiction Wiki. IFDB – the Interactive Fiction Database, a game catalogue and recommendation engine. 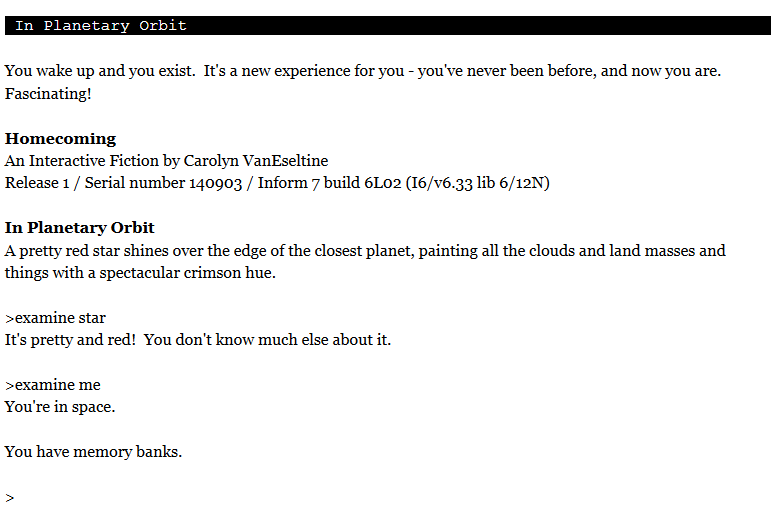 Planet IF – a feed aggregate of interactive fiction bloggers. IFMud – “A MUD Forever Voyaging” – real-time communication with interactive fiction enthusiasts. How does one play “An Adventurer’s Backyard”? The IFDB page says it was written in Inform 7, but I can’t load the blorb file as Glulx or Z-code. Error on my part on the IFDB page. You’ll need ADRIFT Runner for this game, and I’ve updated the IFDB page to reflect this game being created in ADRIFT. When will the judging links be open to the public, or did you just forget to flip the right switch to make them available? Not that I’m going to judge anything super-asap, it’s just, I’ve forgotten that sort of thing, too. Also, I’m assuming betatesters can’t vote on games they tested, or discuss them publicly? And this includes helping with hints? They’re open now – that was one more switch that needed flipping. Thanks for warning me! Betatesters should use good judgment and recuse themselves if they don’t think they can be impartial, but there’s actually no rule against them voting on games they tested. And since authors can discuss their own games publicly, it’s totally fine for betatesters to discuss them. Carolyn! ParserComp is a fantastic idea. Next time I’ll submit a game. Promise.